This has been an amazing Autumn day. It started with bright sun and temps in the sixties…a perfect day to climb Bob’s Hill in Cunningham Falls State Park. 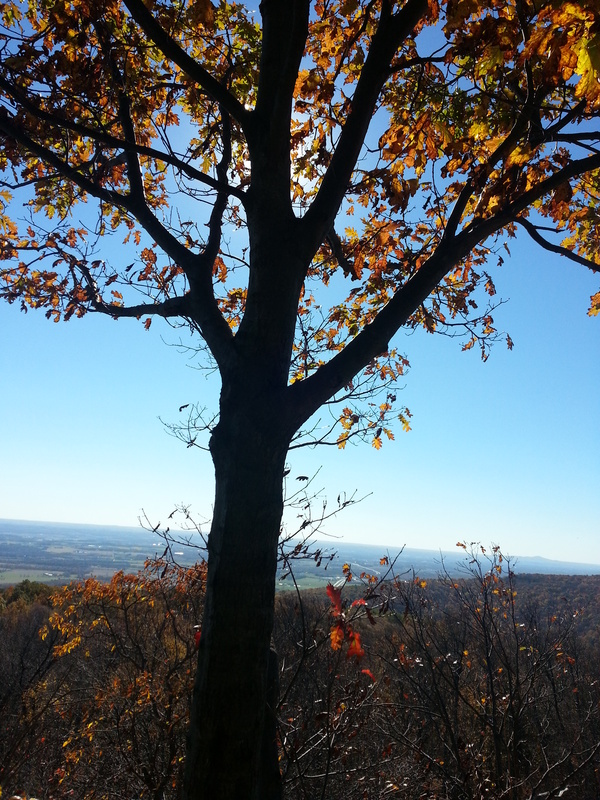 This was my first time up to Bob’s Hill, although I am familiar with the area having climbed to Cat Rock, Chimney Rocks, and other high points in the Catoctin range. Filling the bladder with water and tucking a couple of sandwiches, in addition to some cheese for Sidekick Pauli, into the pack, I realized it would not be so easy to slip out of the house with only one dog in tow! Little Caesar helped me placate the other canines with a plan that had us walking all three dogs around the block, then quickly leading two, who were not going, back into the house, while Sidekick Pauli got into the back of the car! It worked! If you are headed to Bob’s Hill, then I would suggest parking at Catoctin Furnace. 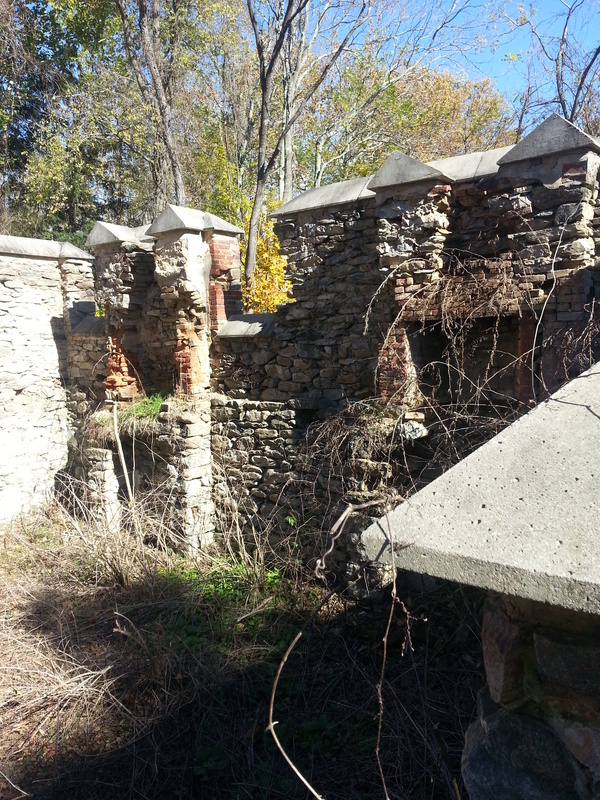 It is free to park at the furnace, and it is a pretty interesting site to look around. The Ironmaster’s house, which is in ruins, is well worth a look see. Head up the short hill from the parking lot to pick up the trail that will lead to the Manor area of Cunningham Falls State Park. This is a short trail, about 1/4 mile, but has some interesting features such at the Bowstring Arch bridge. This beautiful, historic bridge takes you across Little Hunting Creek as you head toward the elevated bridge crossing Route 15 (pretty much a super highway!). 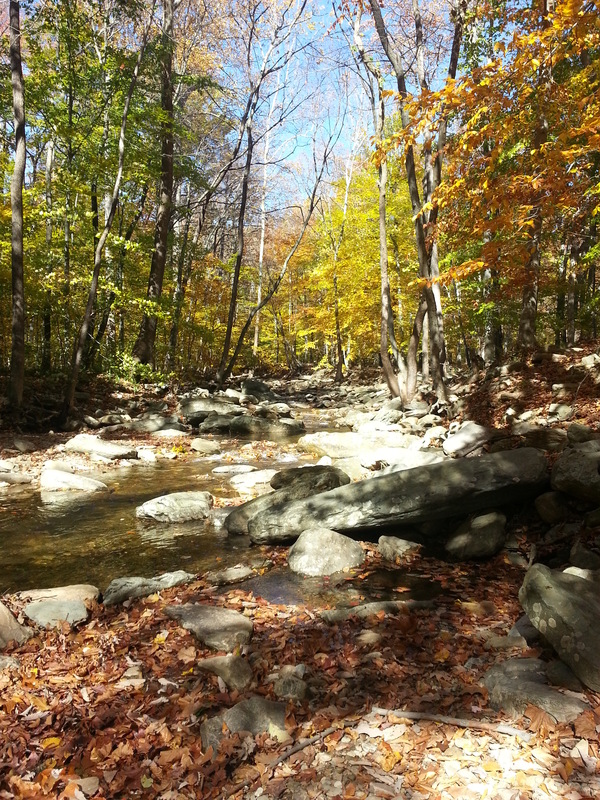 There are several hiking trails in the Cunningham Falls SP/Catoctin Mountain Park area. A great map of the trails is provided by the National Park Service. Once across Route 15, Sidekick Pauli and I took a little break at the creek. The sun was breaking through golden leaves making the water sparkle as it spilled over the rocks. Sidekick Pauli couldn’t resist stepping into the cool stream as she bent to take a drink. After trying the water in several spots, finding them all absolutely delightful, she turned to me with a big smile on her face! Ready to go, Papa? Oh yes, ready to go! We walked along the creek looking for the blue blazes that mark the Catoctin Trail. We found it without too much difficulty and headed to the right and up the hill. I was surprised and pleased to find that I did not need to stop to catch my breath on the way up to Bob’s Hill overlook. A few times I stopped briefly to take in the fall splendor and listen to the wind as it roared up from the valley. The wind was ferocious at times, pushing the trees aside allowing me a glimpse of crystal blue sky. Ahhhhh! All the way up to the overlook we were alone! It was wonderful! We checked out the overlook to the right first. Then we backtracked and headed to the overlook on the other side. I don’t know which I liked better! We sat down to eat our snack at the second overlook. It was one of those moments that you want to stay in forever. The gusting wind caused several leaves to let loose and fly. The sunlight made the color of the leaves sparkle as they were carried by the wind off the mountain and down into the hollow. I felt all at once like I was part of the mountain. I let the wind push against me and instead of turning away from it, I looked up into it, feeling it make my eyes tear up and sting my cheeks. I took a deep breath as it blew, the freshness of it filling me up. I did a sideways glance to check on Pauli and found she too had her nose turned up to greet the wind! It was just one of those moments. Leaving the overlook several minutes later we continued toward Cat Rock. I had no plans to visit Cat Rock today, but I wasn’t ready to turn around and head back to the car yet. Plus, we were now on the ridge which was easy walking! Easy walking means I was able to just let my thoughts wander. I thought about life, work, hiking, dogs, cats, … then something popped into my head that made me pause. A woman said to me the other day that she wasn’t a strong hiker because she was so slow. It bothered me. It bothered me because strong is not the same as fast. I consider myself a strong hiker, but I hike at a steady 2 mph pace in the mountains. I have been hiking for a long time, have confidence in my abilities, and know when I should challenge myself and when I should turn back. But I am not fast. I thought about this because I was thinking this hike up Bob’s Hill is a moderate hike. I think anyone could do it. When I say anyone could do it, I mean, anyone could do it in a time that is right for them. This entry was posted in Off the AT...Exploring other trails! 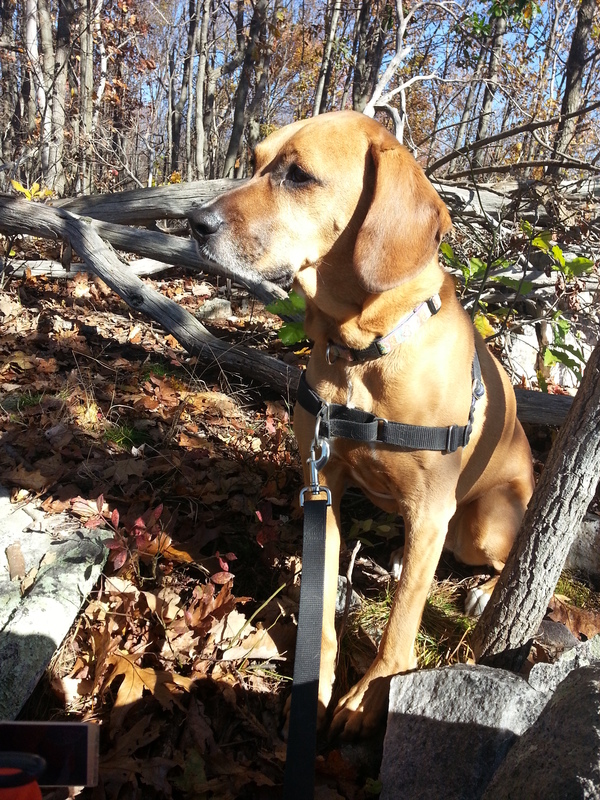 and tagged Bob's Hill Catoctin Mountains, Catoctin Mountain Park, Cunningham Fall State Park, Hiking, hiking maryland, hiking near frederick maryland, hiking with dogs, Outdoors, outdoors maryland, thurmont maryland, walking. Looks like a beautiful day for a hike. Love the leaves! I enjoyed experiencing the beautiful fall through your pictures! Thank you! The whole weekend was outstanding!